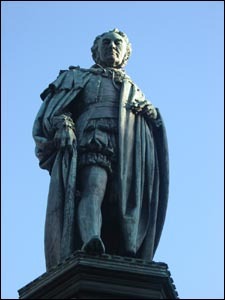 This statue of Walter Francis Montagu Douglas Scott (1806-1884), the 5th Duke of Buccleuch and the 7th Duke of Queensbury K.G. was unveiled in Parliament Square on 7th February 1888. The regal bronze cast depicts a standing figure wearing Order of the Garter robes. The design for the main part of the statue was by J. Edgar Bohem. Various other artists were responsible for the panels which illustrate episodes in the Duke's life and family history. The battle scenes are particularly graphic.